The Cameron government has now, more than a decade later, adopted a similar legal positon, citing Article 51 and justifying the strike as an act of self-defence against a member of a known terrorist group, whom intelligence reportedly indicated was involved in the ongoing organisation of terror threats against the British public. Yet whilst Cameron’s legal case may be similar to that employed by the United States, the Prime Minister has considerably less domestic legal authority to execute such strikes than the American President. First, although the CIA’s drone campaign enjoys broad bi-partisan support, the British Parliament voted in August 2013 not to authorise air strikes in Syria. Second, whilst Obama’s administration has faced frequent criticism over the lack of transparency of its use of drones, each strike is briefed to the relevant Senate Oversight Committees, providing - in theory at least - the important judgement of an authoritative external entity which can validate the fact that the government’s target is legitimate. This oversight was not always in place. It has taken a decade of legal debate and action by political campaigners, non-governmental organisations and legal bodies to force more aspects of the highly secretive operations into the light. Although a certain degree of secrecy will remain necessary to avoid exposing intelligence sources and methods, the UK government will do well to learn from the American experience, and provide more transparency and oversight by choice, before such details are eventually forced out by legal challenges and possible information leaks. Any future British drone strikes would benefit from the credibility of a trusted external body confirming the decision to employ lethal force is right and proper under the law. 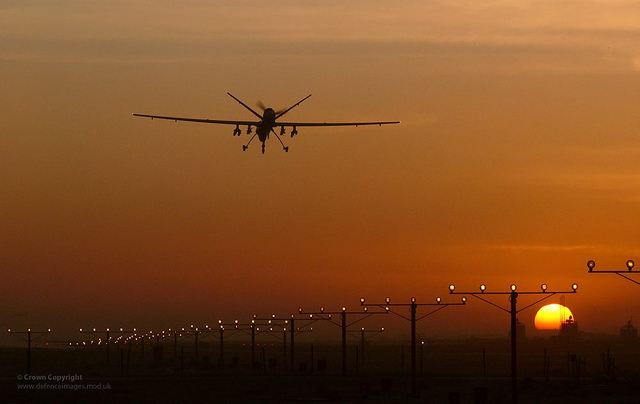 Since greater scrutiny has been placed upon the CIA’s drone campaign, the ratio of civilians killed in strikes has dramatically decreased, showing the wider benefits of a more transparent approach. Critics of Britain’s targeted killing have taken particular issue with the use of the term “imminent” with regard to the threat posed by Khan, arguing that the government has presented no evidence to justify the necessity of self-defence, citing the legal precedent from the Caroline case which defined an imminent threat as “instant, overwhelming, leaving no choice of means, and no moment of deliberation.” Imminence doctrine classically depended upon timing. Only when an attack was certain to occur, could a nation employ force in preemptive self-defence. Yet, as the former Bush administration lawyer John Yoo argued, this traditional concept did not address cases in which an attack was likely to happen, but its timing was unpredictable – the sort of surprise that terrorists rely upon to create maximum shock value. Furthermore, the original legal definition of imminence failed to deal with covert activity, where, according to Yoo, “the best defense will be available only during a small window of opportunity when terrorist[s] become visible.” Thus, haunted by the government’s failure to take decisive action against Osama bin Laden prior to 9/11, the United States challenged that the rules of self-defence needed to adapt to meet the evolving terrorist threat. Terrorists came to represent a continuous and ongoing threat of unlawful aggression. As Professor of Law, Russell Christopher, explains, under America’s post-9/11 definition it does not matter whether or not the terrorist is actually being aggressive at the time of the strike; “it is their very status as a terrorist which qualifies as the conduct of posing an imminent threat.” The philosopher, Jeff McMahan, has explained this position further, arguing that “even while terrorists are sleeping or eating dinner or doing some other innocuous activity, they do not lose their status as terrorists and thus are continuously and invariably constituting imminent threats.” Thus those looking to apply the traditional legal definition are missing the point that the British government has now adopted America’s post-9/11 definition of the term.